Manage all aspects of your technologies and IP assets. Build your relationships with dynamic CRM functionality. Build your portfolio and grow your business while protecting your interests. Manage your budget, track payments, revenue and more. Inteum Core is a comprehensive intellectual property management solution designed specifically for business. Through 25 years of software innovation, the Inteum system has been refined and distilled to its core elements, and is simply the most powerful tool to help you manage and market your IP assets. Whether it’s patents, copyrights, trademarks, plant variety rights, designs or any other type of intellectual property, it can all be recorded and managed within Inteum Core. 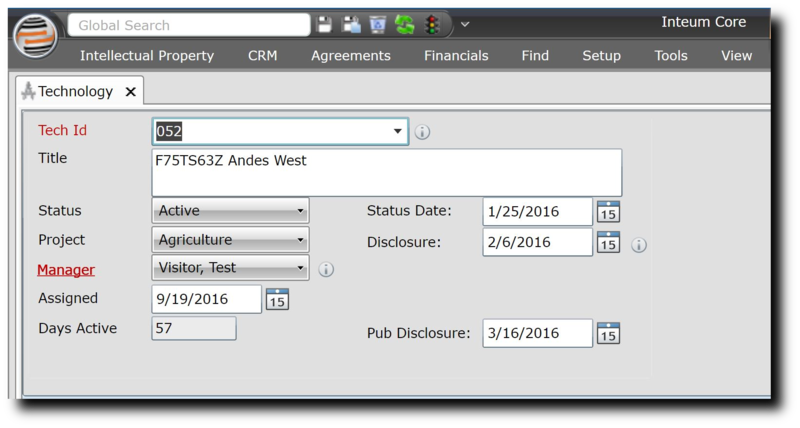 Record all details of your technologies and IP Assets, including key dates, legal information, status, and related financial information, review the complete patent genealogy tree at a glance, and stay on top of your compliance obligations. From inventors to investors, Inteum Core’s CRM module gives you complete control over your contacts and related companies. Link contacts to companies, record emails, conversations, notes and more. Track the progress of your product development and marketing efforts with Marketing Projects. From Confidentiality and Option agreements to License agreements, Inteum can ensure that all details are recorded and that the agreement obligations are met. Set up notifications for critical deliverables and you’ll never miss another deadline. Inteum has all the tools to help you manage and monitor the financial impact of your innovations. 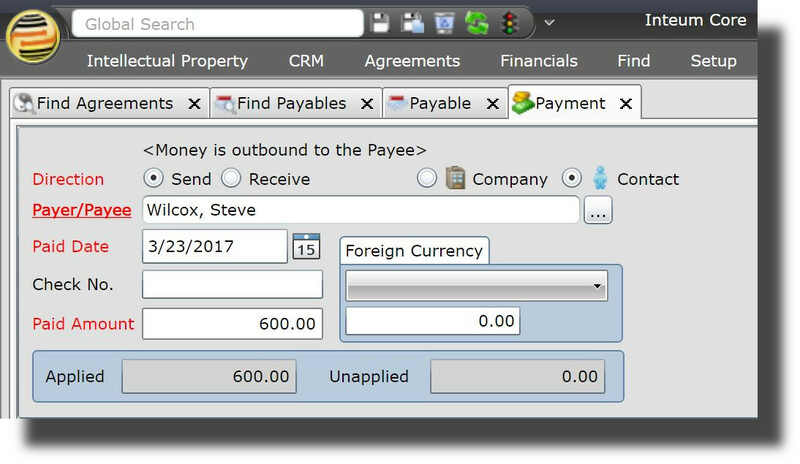 Create Payables and Receivables, quickly generate invoices and statements, as well as reimbursable expenses for Agreements. Track revenue distribution, and create expense budgets.